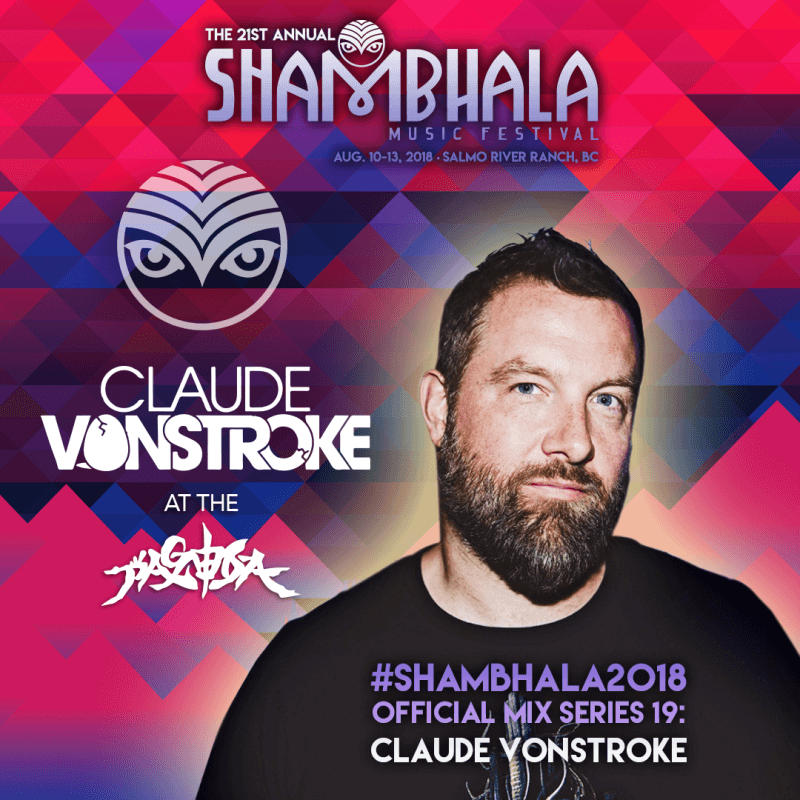 Legendary Detroit native and Shambhala Music Festival veteran Claude VonStroke will be making his return to The Pagoda Stage this year. The Dirtybird label boss has established himself as one of the most entertaining performers in electronic music with a unique mixture of house, techno, hip-hop, drum and bass and really whatever he feels like throwing down at the moment. There is one thing we can promise you right now: you will never be bored when Claude steps up to the decks because the man doesn’t just play music, he starts a party. We sat down with the man himself to chat about Shambhala Music Festival memories, his favourite up and coming artists, and much more. We even scored an exclusive mix to give you a sneak peak into what’s to come. So turn your volume up and prepare yourself for Papa Claude to bring some funky beats to your eardrums this August. Can you share with us one of your most memorable moments from playing and experiencing Shambhala Music Festival? I got up into the booth at The Pagoda one year after smoking a huge joint and there were people literally bursting out of every nook and cranny of every inch and I was thinking….man, am I about to DJ here? Because this party is crazy. Then I started thinking about all the tunes I had with me and I got really excited to play. You’ve always had your ear to the ground when it comes to new music. Who are some up-and-coming artists that you’ve had your eye on and think we should be checking out? Steve Darko is going to go on tour with me in the fall I really think he is one to watch. Wyatt Marshall just remixed Who’s Afraid of Detroit? and its pretty sick. He’s not so upcoming any more but I really like Chambray as well. Your collaboration with Eprom was huge in the scene as a merger between house and bass. Can you tell us about the creative process behind “Grenade” and what prompted your collaboration with Eprom? Actually it made more waves in the hard techno community which is even more crazy and unexpected! Everybody knows I love Eprom and his genius sound design. This started out as a remix for him and got so far away from the original we decided it was a really cool track that could stand on its own. I’m happy to be bending the rules and changing the idea of who can do what and on what label and all that nonsense. Big ups on on your Walay (My Bae) EP. Did you utilize any new techniques or sounds on the release that differ from past albums, and how do you hope the project makes listeners feel? On that record I was experimenting with some outboard gear and also some new vocal techniques. But in general it came out of all these 5am studio sessions I would do where I would make a beat at 5am every day and then pick the best ones at the end of the month. I was hoping to put out an EP that was really dark on one side and really light on the other side. I think it worked, but who knows? With a festival, label and two musical projects, you must be constantly working. When you do have some downtime, how do you spend it? Do you have any hobbies outside of the music scene? All downtime goes to my wife and kids. There isn’t very much downtime but I like to maximize it and play with the family as much as possible. I also love watching movies. I watch everything even if it’s on my iPad I end up watching it on airplanes.